To get access to dozens of graphs and tables on telephonic case management, order your copy today for $107. 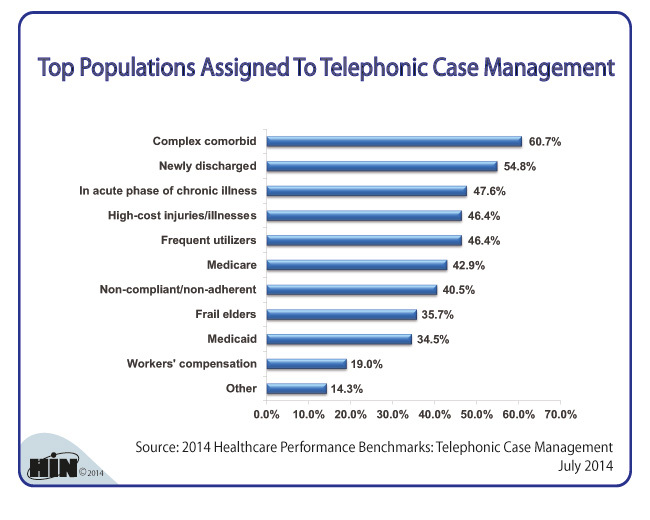 This report delivers a comprehensive set of metrics from more than 100 healthcare organizations on emerging trends in telephonic case management of patients and health plan members, examining the populations served and tools employed by telephonic case managers, as well as the impact of these telephonic connections on health outcomes, utilization and the organization's bottom line. This resource is available for $107 in our Online Bookstore or by calling toll-free (888) 446-3530. Listen to Gail Miller, the VP of telephonic clinical operations in Humana's care management organization, Humana Cares/SeniorBridge, says that Humana’s remote monitoring pilots go beyond traditional targets of heart failure, diabetes and COPD to observe functionally challenged members.